Do you know what Crepuscular Rays are? You know when you see the actual rays of sunshine coming through the clouds or a forest? That's them! It always makes me feel more connected to nature somehow when I see them. Without those moments you'd never realize there are actual rays of sunshine! My grandfather was in the Navy and he brought back beautiful gifts for the love of his life, my grandmother, every time he came back into port. Some of those gifts are now in my home and bead drawers. These vintage Venetian glass beads were from sets of necklaces and bracelets that she received. I've made myself some jewelry using them, but there are some that I'd love to share. 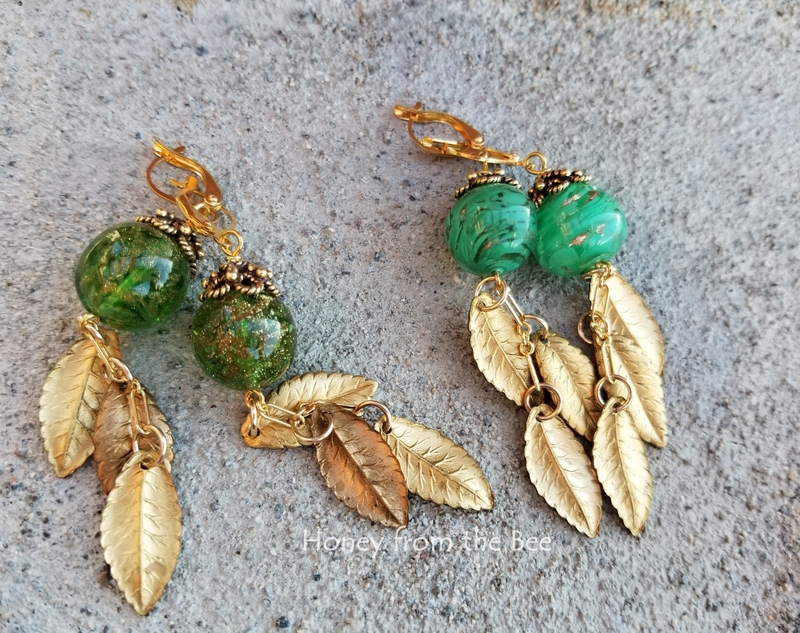 Besides the vintage glass beads I've added vintage brass leaves to dangle and sway in the breeze. NOTE: Two different greens are shown. The darker green pair on the left is still available. The other one has sold. 3" in length from the top of the earwire to the bottom of the lowest leaf.